Vision is by far the most used of the five senses and is one of the primary means that we use to gather information from our surroundings. More than 75% of the information we receive about the world around us consists of visual information. The eye is often compared to a camera. Each gathers light and then transforms that light into a "picture." Both also have lenses to focus the incoming light. Just as a camera focuses light onto the film to create a picture, the eye focuses light onto a specialized layer of cells, called the retina, to produce an image. Parts of the eye. Although the eye is small, only about 1 inch in diameter, each part plays an important role in allowing people to see the world. Anatomy of the eye. The eye is surrounded by the orbital bones and is cushioned by pads of fat within the orbital socket. Extraocular muscles help move the eye in different directions. Nerve signals that contain visual information are transmitted through the optic nerve to the brain. The orbit is the bony eye socket of the skull. The orbit is formed by the cheekbone, the forehead, the temple, and the side of the nose. The eye is cushioned within the orbit by pads of fat. In addition to the eyeball itself, the orbit contains the muscles that move the eye, blood vessels, and nerves. The orbit also contains the lacrimal gland that is located underneath the outer portion of the upper eyelid. The lacrimal gland produces tears that help lubricate and moisten the eye, as well as flush away any foreign matter that may enter the eye. The tears drain away from the eye through the nasolacrimal duct, which is located at the inner corner of the eye. The eyelids serve to protect the eye from foreign matter, such as dust, dirt, and other debris, as well as bright light that might damage the eye. When you blink, the eyelids also help spread tears over the surface of your eye, keeping the eye moist and comfortable. The eyelashes help filter out foreign matter, including dust and debris, and prevent these from getting into the eye. The conjunctiva is a thin, transparent layer of tissues covering the front of the eye, including the sclera and the inside of the eyelids. The conjunctiva keeps bacteria and foreign material from getting behind the eye. The conjunctiva contains visible blood vessels that are visible against the white background of the sclera. The white part of the eye that one sees when looking at oneself in the mirror is the front part of the sclera. However, the sclera, a tough, leather-like tissue, also extends around the eye. Just like an eggshell surrounds an egg and gives an egg its shape, the sclera surrounds the eye and gives the eye its shape. 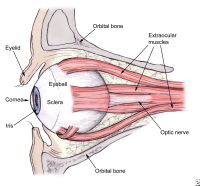 The extraocular muscles attach to the sclera. These muscles pull on the sclera causing the eye to look left or right, up or down, and diagonally. The cornea is the transparent, clear layer at the front and center of the eye. In fact, the cornea is so clear that one may not even realize it is there. The cornea is located just in front of the iris, which is the colored part of the eye. The main purpose of the cornea is to help focus light as it enters the eye. If one wears contact lenses, the contact lens rests on the cornea. The anterior chamber is the fluid-filled space immediately behind the cornea and in front of the iris. The fluid that fills this chamber is called the aqueous humor. The aqueous humor helps to nourish the cornea and the lens. The iris, which is the colored part of the eye, controls the amount of light that enters the eye. The iris is a ring shaped tissue with a central opening, which is called the pupil. The iris has a ring of muscle fibers around the pupil, which, when they contract, causes the pupil to constrict (become smaller). This occurs in bright light. A second set of muscle fibers radiate outward from the pupil. When these muscles contract, the pupil dilates (becomes larger). This occurs under reduced illumination or in darkness. The anterior chamber angle and the trabecular meshwork are located where the cornea meets the iris. The trabecular meshwork is important because it is the area where the aqueous humor drains out of the eye. If the aqueous humor cannot properly drain out of the eye, the pressure can build up inside the eye, causing optic nerve damage and eventually vision loss, a condition known as glaucoma. The posterior chamber is the fluid-filled space immediately behind the iris but in front of the lens. The fluid that fills this chamber is the aqueous humor. The aqueous humor helps to nourish the cornea and the lens. The lens is a clear, flexible structure that is located just behind the iris and the pupil. A ring of muscular tissue, called the ciliary body, surrounds the lens and is connected to the lens by fine fibers, called zonules. Together, the lens and the ciliary body help control fine focusing of light as it passes through the eye. The lens, together with the cornea, functions to focus light onto the retina. 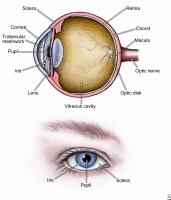 The vitreous cavity is located behind the lens and in front of the retina. It is filled with a gel-like fluid, called the vitreous humor. The vitreous humor helps maintain the shape of the eye. The retina acts like the film in a camera to create an image. When focused light strikes the retina, chemical reactions occur within specialized layers of cells. These chemical reactions cause electrical signals, which are transmitted through nerve cells into the optic nerve, which carries these signals to the brain, where the electrical signals are converted into recognizable images. Visual association areas of the brain further process the signals to make them understandable within the correct context. The retina has two types of cells that initiate these chemical reactions. These cells are termed photoreceptors and the two distinct types of cells are the rods and cones. Rods are more sensitive to light; therefore, they allow one to see in low light situations but do not allow one to see color. Cones, on the other hand, allow people to see color, but require more light. The macula is located in the central part of the retina and has the highest concentration of cones. It is the area of the retina that is responsible for providing sharp central vision. The choroid is a layer of tissue that lies between the retina and the sclera. It is mostly made up of blood vessels. The choroid helps to nourish the retina. The optic nerve, a bundle of over 1 million nerve fibers, is responsible for transmitting nerve signals from the eye to the brain. These nerve signals contain information for processing by the brain. The front surface of the optic nerve, which is visible on the retina, is called the optic disk or optic nerve head. Six extraocular muscles are attached to each eye to move the eye left and right, up and down, and diagonally, or even around in circles when one wishes. Snell, Richard S. and Michael A. Lemp. Clinical Anatomy of the Eye. 2nd ed. Wiley-Blackwell, 1997.